NYTimes: "One Flew Over the Cuckoo's Nest" is at its best when Mr. Forman is exercising his talents as a director of exuberant comedy that challenges preconceived notions of good taste. It's not too far from the mark to describe Randle as a sort of Mister Roberts who finds himself serving aboard the U. S. S. Madhouse. It's to Mr. Forman's credit that the other patients in the ward, though suffering from all sorts of psychoses, are never patronized as freaks but are immediately identifiable as variations on ourselves, should we ever go over the edge of what's called sanity. Mr. Nicholson slips into the role of Randle with such easy grace that it's difficult to remember him in any other film. It's a flamboyant performance but not so overbearing that it obscures his fellow actors, all of whom are very good and a few of whom are close to brilliant, including William Redfield (as an egghead patient who talks grave nonsense), Will Sampson (as a deaf-mute Indian) and Brad Dourif (as a young man with a fatal mother complex). Roger Ebert Review (1975): If Forman was preaching a parable, the audience seemed in total agreement with it, and I found that a little depressing: It's a lot easier to make noble points about fighting the establishment, about refusing to surrender yourself to the system, than it is to closely observe the ways real people behave when they're placed in an environment like a mental institution. That sort of observation, when it's allowed to happen, is what's best about "One Flew Over the Cuckoo's Nest." We meet a classic outsider -- R.P. McMurphy, a quintessentially sane convict sent to the institution as a punishment for troublemaking -- whose charisma and gall allow him to break through to a group of patients who've mostly fallen into a drugged lethargy. Their passive existence is reinforced by the unsmiling, domineering Nurse Ratched, who lines them up for compulsory tranquilizers and then leads them through group therapy in a stupor. 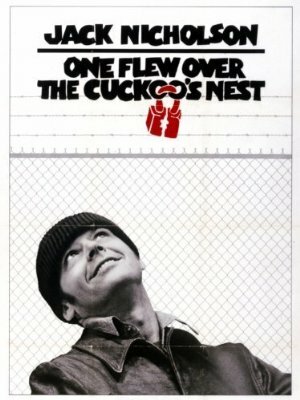 Roger Ebert again (2003): Is "One Flew Over the Cuckoo's Nest" not a great film because it is manipulative, or is it great because it is so superbly manipulative? I can see it through either filter. It remains enduringly popular as an anti-establishment parable, but achieves its success by deliberately choosing to use the mental patients as comic caricatures. This decision leads to the fishing trip, which is at once the most popular, and the most false, scene in the movie. It is McMurphy's great joyous thumb in the eye to Ratched and her kind, but the energy of the sequence cannot disguise the unease and confusion of men who, in many cases, have no idea where they are, or why. I don't know if there is any other villain in film history that I hate more than Nurse Ratched. She is evil at its most banal and insidious. In the climactic scene where McMurphy attacks her I am right there with him. All of Nicholson's performances from the 1970s are amazing, but of course this one got him the Oscar because it's a little more show-off-y than say, Chinatown or The Last Detail. There is one moment that stands out for me as a perfect illustration of his extraordinary presence and talent. It's a single shot that lasts a little over a minute during the party sequence, just a medium close-up. He doesn't really do anything. He doesn't say anything. We just watch him reacting to what's happening around him and he really is right there in that moment. That's the thing Jack always had over every other actor, the ability to just be fully present, in the moment, honestly living the scene. I saw this when I was ten and it scared the beejeezus out of me. That may be why horror films never scared me: no monster or serial killer could ever compete with Nurse Ratched. I had a teacher show this movie in class in about sixth grade, which in retrospect seems like we might have been a bit younger than the intended audience. It's a great movie, though I found the book to be more powerful. I fortunately read the book before I saw the movie when it came out, then I watched it again a year or so ago. It confirmed how much the book had been adapted to suit the acting of Nicholson as McMurphy, whereas the book focused on Chief Broom. At the beginning of the book, the Chief (in his mind) climbs into a painting and walks around in it. It is a most memorable sequence that isn't shown in the movie because it woud have detracted from McMurphy's presence. But it was the Chief's way of absenting himself from what was the manufactured craziness of the asylum. So when McMurphy was lobotomised, the Chief saw that as McMurphy's painting being taken from him, making him "dead". That's why he had to stop him living outside in the madness. Then he smashed the "painting" and walked out into the real world. In the movie, the Chief was a background character, and a foil for McMurphy, until the end. We feel sad for McMurphy, where we should be feeling joy for the Chief. If you want to make it into an analogy, then that could make sense too. The book is excellent and worth a read. It's different enough from the movie that one doesn't really ruin the other. Slasher and traditional horror movies rarely scare me. Of course I jump at a jump scare, but just because it's unexpected, not frightening. The Nurse Ratched type of character scares the hell out of me though because there are too many people like her in reality. I probably won't have a knife wielding maniac come at me in my house, but I probably do interact with psychos like her every day. I first watched this at about age 14 and it was very confusing to me how attracted to and frightened by Ratched I was. I have talked with other people who didn't find her attractive at all but when we first meet her I did and that made her an even more powerful character because there was such a conflict between calm, pretty nurse and evil, insane control freak. A few years ago I spent about 3 days in a place just like the hospital from this movie. It is a very old building all painted white and the doors are chain link. Many of the people wore basically pajamas and robes and some just shuffled around. People were constantly begging for or refusing medications. Thankfully the nurses and staff there were far from evil, but they sure showed the signs of living in this situation. If the screaming and conversations with no one in the middle of the night hadn't kept me awake, the sudden realization that I somehow found myself in the Cuckoo's Nest would have. Though I really like this movie and have seen it several times, I haven't watched it since then and I'm not sure if I ever will. Michael Douglas' first Oscar. Swept the big 5 that year. Louise Fletcher used to rent movies from me and she was extremely friendly and nice. It was impossible to come to terms with this fact. This is certainly the only movie in my top 10 where the book is in my top 10 as well.